What are the various forces influencing the role of the prison in late modern societies? What changes have there been in penality and use of the prison over the past 40 years that have led to the re-valorization of the prison? Using penal culture as a conceptual and theoretical vehicle, and Australia as a case study, this book analyses international developments in penality and imprisonment. Authored by some of Australia’s leading penal theorists, the book examines the historical and contemporary influences on the use of the prison, with analyses of colonialism, post colonialism, race, and what they term the ’penal/colonial complex,’ in the construction of imprisonment rates and on the development of the phenomenon of hyperincarceration. 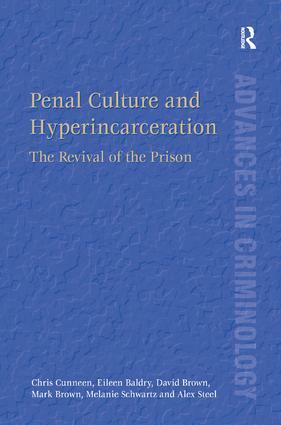 The authors develop penal culture as an explanatory framework for continuity, change and difference in prisons and the nature of contested penal expansionism. The influence of transformative concepts such as ’risk management’, ’the therapeutic prison’, and ’preventative detention’ are explored as aspects of penal culture. Processes of normalization, transmission and reproduction of penal culture are seen throughout the social realm. Comparative, contemporary and historical in its approach, the book provides a new analysis of penality in the 21st century. Professor Chris Cunneen is a conjoint professor of criminology in the Faculty of Law of the University of New South Wales. He held the NewSouth Global Chair in Criminology at UNSW from 2006 to 2010. Until 2005, Professor Cunneen was the Director for the Institute of Criminology at the University of Sydney, a position held since 1995. He has been teaching Criminology at the University of Sydney Law School since 1990. Previously he held research positions with the Indigenous Law Centre at UNSW and the NSW Bureau of Crime Statistics and Research. Professor Cunneen is a member of the Editorial Boards of the Australian and New Zealand Journal of Criminology (since 2010), Australian Indigenous Law Reporter (since 1997), Current Issues in Criminal Justice (since 1991) and Youth Justice (since 2005). He is also a Series Editor of the Institute of Criminology Monograph Series. He was the Chairperson of the Juvenile Justice Advisory Council which advised the Minister on juvenile justice matters from 2002-2008. He was a member of the Attorney-Generals Taskforce on Child Sexual Assault in Aboriginal Communities. Professor Cunneen has published widely in the area of juvenile justice, policing, restorative justice and Indigenous issues including reports for the Federal Race Discrimination Commissioner and a number of books on issues such as juvenile justice; Indigenous legal issues; hate crime, and policing. He has also contributed articles to many journals. Professor Eileen Baldry's main areas of research and publishing are in: the criminal justice system focusing on critical criminology-critical disability studies development, vulnerable persons and minority groups - people with mental health disorders and cognitive disability, women and Indigenous persons; throughcare, transition from prison, post-release and homelessness; and criminal justice-human service system interactions; and in Indigenous social work; and community and social development in social housing. Professor Baldry is currently a Chief Investigator on 1 ARC Discovery project, 2 ARC Linkage projects and 1 NHMRC project and leads a number of smaller linked projects in the areas noted. Emeritus Professor David Brown taught Criminal Law, Advanced Criminal Law, Criminal Justice, Crime Prevention, Community Corrections and Penology courses at the University of NSW in Sydney from 1974 to 2008. He is a co-author of the major and innovative Criminal Laws (1990), (2nd edn 1996) and (3rd edn 2001) (4th edn 2006) (5th edn 2011) which has become the leading student teaching text in criminal law in universities in NSW. He is very widely published across the broad areas of criminal law, criminal justice, criminology and penology, both in Australia and internationally. He has co-authored or co-edited 10 books; published 33 chapters in books, and over 100 articles in journals and in conference proceedings published; given 120 conference papers or public addresses all over the world; and is a regular media commentator on criminal justice issues. Dr Mark Brown is a Senior Lecturer in the School of Law, Sheffield University, UK, and an Honorary Senior Fellow in the School of Social and Political Sciences at the University of Melbourne, Australia. Previously based in Geneva, he worked as a law and justice consultant focused on actors in the international sphere. His earlier academic career was spent in Australia where he was in the criminology program at the University of Melbourne. He has also been a visiting professor at the Institute for Criminology and Criminal Law at the University of Lausanne and at Delhi University Law School. He is co-author of Penal Culture and Hyperincarceration (Routledge 2013) and author of Penal Power and Colonial Rule (Routledge 2014) and the forthcoming Remaking Criminology. Melanie Schwartz has been teaching criminal law in the Faculty of Law, UNSW, since 2006. She also teaches in the Indigenous programs in the Faculty including the pre-law program and the winter school. She co-convenes the criminal justice stream in the Diploma of Humanities. Alex Steel is the Associate Dean (Education) and an Associate Professor in the Law School. He has published widely on theft, fraud and dishonesty law and theory. He is an author of the highly regarded Criminal Laws: Materials and Commentary on the Criminal Law and Procedure of NSW (4th ed). Alex has also produced detailed law reform reports for Government and makes regular submissions to law reform bodies. Alex is a member of the Criminal Law Committee of the NSW Bar Association and an expert advisor to the NSW Law Reform Commission. He was previously a Consultant to the NSW Attorney General's Department, Criminal Law Review Division.